#37) Photoshopped Polar Bear: Do Scientists Really Have to be “Media Victims”? Q: How many Ph.D.’s does it take to communicate effectively their outrage over attacks on climate science? A: Apparently more than 255. On Friday, Science Magazine published a letter from 255 scientists complaining about the attacks on their credibility, but they accompanied the letter with a faked photo of a polar bear on an ice floe. A detailed description of the incident has been given by Andy Revkin on his blog Dot Earth. YES WE CAN (be made fools of). On Friday 255 scientists published a letter in Science Magazine that was accompanied by this photo from iStockphoto. 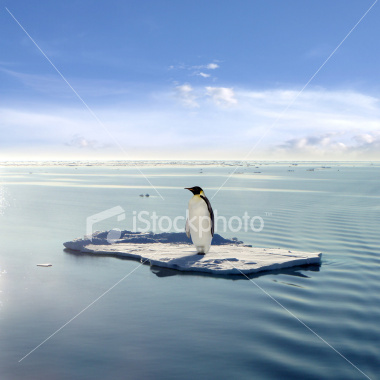 Gee willikers, isn't that a penguin posing on the same ice floe? Wow, someone must have been awfully talented to lead the polar bear off the ice and replace it with the penguin, then manage to get exactly the same ripples in the water. 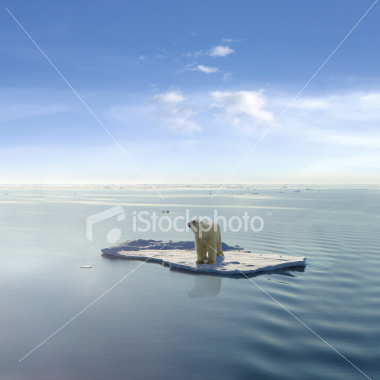 YEP, THEY PHOTOSHOPPED IT: The climate skeptics have tracked down the original iStockphoto page with the photo. As you can see the iStockphoto people openly admit the image was concocted with Photoshop. Why, oh, why would the scientists allow their letter to be accompanied by this photo? They will answer, "the editors did it." Doesn't matter. Don't be SUCH media-clueless scientists. In the future, submit your letter with a loud, clear warning -- DO NOT PUBLISH WITH A FAKED PHOTO. Oh, and by the way, THANKS Science Magazine for looking out for the interests of the science community. ENOUGH WITH THE POLAR BEARS In my movie "Sizzle: A Global Warming Comedy" I dreamed I was raped by a polar bear. It would take a team of psychologists to figure out the exact significance of that scene, but I think it was intended as a gesture to all the marketing and fund-raising departments of the major conservation groups who have rained down on the general public a barrage of polar bear imagery in their relentless pursuit of donor dollars. Enough already. SHOOTING FISH IN A BARREL: Dr. Pat Michaels gloats over how easy it is to spin circles around the climate science community. So far it’s hard to find proof that he’s wrong. At this point, much of the script is predictable. In response to my making hay of this blunder, many scientists will say, “So what. The editors made a trivial mistake, there’s no need to call further attention to it. The point is the climate attacks need to be stopped.” They will label me as the enemy for even engaging in criticism of the science community. Well, I held off making a big deal out of the cover of Al Gore’s latest book where a Photoshopped image of the globe has a hurricane spinning the wrong direction. But this one is just too blatant. Plus Andy Revkin already weighed in on it yesterday on his NY Times blog, so it’s not like I’m a lone voice. On Saturday I wrote to one of the signing scientists about it. He had no clue the photo was doctored, but said it wasn’t submitted by them — it was the creative touch of the folks at Science. As if the blame should just be placed on the magazine so we can get back to the message of the letter. But that’s not how it works. If the President of the United States gives a television speech where we can see a booger hanging down from his left nostril, the speech is useless. THAT is how it works. It will be known as “The Booger Speech” for the rest of time. It doesn’t matter how irrelevant the booger was, or how powerful the speech was. Andy Revkin titled his piece on this, “Sweating the Details in Climate Discourse.” As always, it’s a great post, but I disagree with the title (actually, the text of his article sort of does, too). These things aren’t “details.” They have the potential to be EVERYTHING. One tiny racist comment in a five page speech is not a “detail” — it’s the stuff that ends entire careers. And so yes, one faked photo, no matter who came up with it, is enough to discredit the well-intentioned efforts of 255 scientists in the public’s eye. So please, everyone, for the hundredth time, repeat after me, “PERCEPTION IS REALITY.” The public forms their opinions based on their perception of you and your issue. I kind of wrote a whole book about it. WHY DOES THIS FAKED PHOTO GRAB INTEREST? For starters, because it’s what everyone craves — A GOOD STORY. A letter in Science from 255 outragified scientists IS NOT a good story. It’s simply business as usual. There’s no twist to it. There’s nothing unusual. It’s a yawner — what would you expect. But a letter in Science by 255 outragified scientists, accompanied by a faked photo of a polar bear — now THAT really IS a story! Do you see how this works? The first version numbs the mind of the desensitized public. The second one is stimulating and even entertaining. The challenge for the science community is how to achieve the second one at the expense of their opponents, not themselves. It is possible. It just takes some communications savvy. Which is what they lack and refuse to pay for. WHY DOES THIS SORT OF STUFF KEEP HAPPENING? There you have it. It’s the copious amount of brain power that is exactly the problem. A bunch of Ph.D.’s are the last group who are going to come up with a way to match a team of hired professional communicators. How many times do I have to cite the Ricky Jay quote on 60 Minutes in February — he said it — scientists are the EASIEST group to fool when it comes to sleight of hand. Their excessive learning is their very undoing. More to the point, some things you can’t do by yourself. ARE THE SCIENTISTS REALLY TO BLAME? There are publicists in this world who know enough about IMAGE MANAGEMENT and have enough experience with watching their clients public images get messed with by the media to know better than to allow a magazine to do something like this. I’m meeting with one of them this afternoon in Hollywood to see if I can interview him for The Benshi. I have no doubt he will get a laugh out of this story when I tell him. It’s really pretty staggering. And YES, it does matter. THIS is much of what my book was about. It matters if your hair is a mess when you give a talk. It matters if you rip a giant fart in the middle of making the most important point in your talk. And yes, it matters if you publish a letter of outrage, complaining about being smeared as dishonest, and yet your article is accompanied by a photograph that is tainted by the word “Photoshop” which virtually EVERYONE in today’s society knows symbolizes one big thing — WE DON’T CARE ABOUT THE TRUTH. It’s time for the science community to realize the media are not necessarily your friends, and are not 100% reliable. You don’t have to hate them, but you do have to keep an eye on them. You have to practice constant vigilance (just like what my offshore sailing teacher used to implore us to do when at sea). Well, the actual article wasn’t about that at all. It was about polling data showing that despite the attacks on climate science, the public still has a high opinion of science and scientists. The point of the article was that scientists were not incorporating THAT material into their perspective. I suppose you could conceivably say they were “misreading” the polling data, or maybe just not even looking at it. Regardless, I read the article, then wrote an irritated email to Dan titled, “Bad, bad headline.” He immediately agreed, but explained what I expected to be the case — which is, being a reporter, he wrote only the body of the article. Someone else wrote the headline. So I wrote to the editor, got no reply, then was doubly irked two days later when I awoke to see the same article and headline listed as second most popular on their website. At that point I wrote another email, this one blatantly insulting, more or less channeling the voice of Christian Bale on the set of Terminator last year. Within an hour the headline was changed to, “SOME scientists misread POLL DATA on global warming controversy.” And Dan, who again is an excellent writer, wrote me a nice note thanking me for catching it. So you can fix some of these things. And sometimes its a matter of differing sensitivities. To an editor, there may not have been any evil intent — the difference in those two headlines probably seems trivial. But if you’re in the thick of the issue these days, you know there’s a world of difference between those two. Bottom line, it’s time to put an end to scientists saying, “Oh, the media screwed me, what can I do?” There are ways to interface with the media and be cooperative, supportive, but also vigilant. The image associated with this article was selected by the editors. We did not realize that it was not an original photograph but a collage, and it was a mistake to have used it. This is a far cry better than going with the usual, “Ignore it and hope it goes away,” strategy that has characterized the general response of the climate science world to the attacks of climate skeptics. But then again, this letter also perhaps marks a new attitude for the climate science community. Now if they will just invest in hiring some communications professionals (who are not your standard university outreach people) then there might be hope for their public image. YOUR THOUGHTS: As always, we’re interested in your thoughts — write to us at: info AT randyolsonproductions DOT com.